Wall Street Journal — an annualized 2.3 percent, which would be no change from the advance estimate published in April. FXStreet.com — a slight increase to 2.4 percent. Yahoo Finance — 2.3 percent. Associated Press — 2.3 percent. Given how weak reported spending on goods was in the first quarter (a negative contribution to GDP of 0.24 points) and the relatively modest bounceback in inventories (only +0.43 points after -0.53 the previous quarter), I think there’s some potential for an upside surprise. But we’ll see. The report will be here at 8:30. I begin evaluating it until 9 a.m. after the ADP conference call ends. Real gross domestic product (GDP) increased at an annual rate of 2.2 percent in the first quarter of 2018 (table 1), according to the “second” estimate released by the Bureau of Economic Analysis. In the fourth quarter of 2017, real GDP increased 2.9 percent. The GDP estimate released today is based on more complete source data than were available for the “advance” estimate issued last month. In the advance estimate, the increase in real GDP was 2.3 percent. With this second estimate for the first quarter, the general picture of economic growth remains the same; downward revisions to private inventory investment, residential fixed investment, and exports were partly offset by an upward revision to nonresidential fixed investment. Real gross domestic income (GDI) increased 2.8 percent in the first quarter, compared with an increase of 1.0 percent (revised) in the fourth quarter. 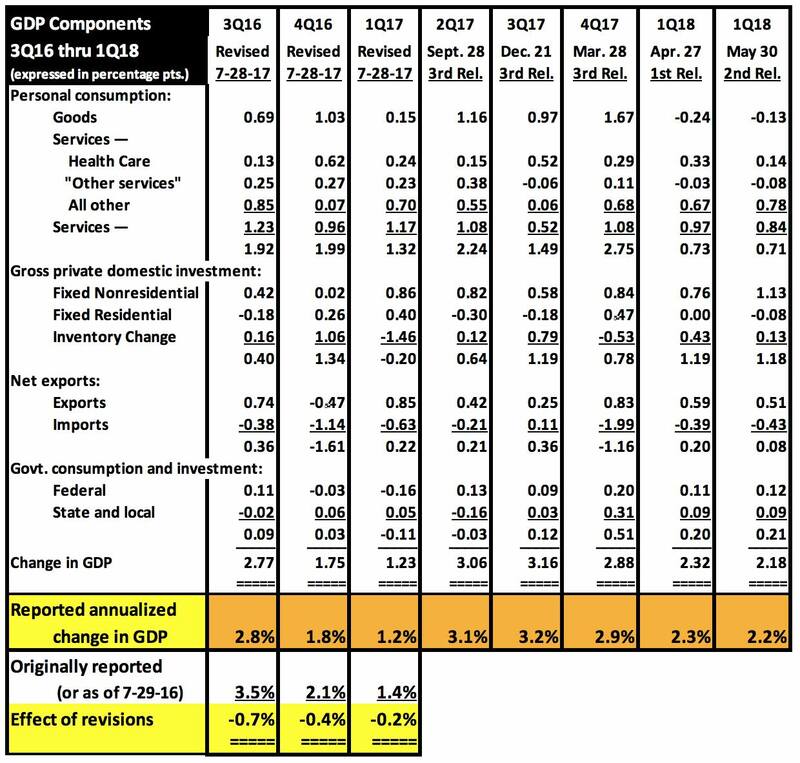 The average of real GDP and real GDI, a supplemental measure of U.S. economic activity that equally weights GDP and GDI, increased 2.5 percent in the first quarter, compared with an increase of 2.0 percent in the fourth quarter (table 1). The deceleration in real GDP growth in the first quarter reflected decelerations in PCE, exports, state and local government spending, and federal government spending and a downturn in residential fixed investment. These movements were partly offset by an upturn in private inventory investment and a larger increase in nonresidential fixed investment. Imports, which are a subtraction in the calculation of GDP, decelerated. Current-dollar GDP increased 4.2 percent, or $202.7 billion, in the first quarter to a level of $19.96 trillion. In the fourth quarter, current-dollar GDP increased 5.3 percent, or $253.5 billion (table 1 and table 3). The price index for gross domestic purchases increased 2.7 percent in the first quarter, compared with an increase of 2.5 percent in the fourth quarter (table 4). The PCE price index increased 2.6 percent, compared with an increase of 2.7 percent. Excluding food and energy prices, the PCE price index increased 2.3 percent, compared with an increase of 1.9 percent (appendix table A). The decrement from consumption expenditures on goods dipped as I expected, but the inventory change went the other way by 0.30 points, from +0.43 to +0.13. If today’s contribution holds, it’s reasonable to believe that inventory change will be a more positive second-quarter contributor. That 1.13-point contribution is the biggest single-quarter contribution since 3Q14. During the next 9 quarters (3Q14 through 4Q16), nonresidential fixed investment GDP contributions totaled only 0.23 points — an average barely exceeding zero per quarter. Collectively, companies for all practical purposes stopped investing in the U.S.
During the most recent five quarters (1Q17 through 1Q18), nonresidential fixed investment GDP contributions have totaled 4.23 points, averaging 0.85 points per quarter. At long last, companies have been investing in the U.S. again. Though it still needs to get stronger, this a critical good-news turnaround which offsets the not-cheery news of today’s slight overall drop.